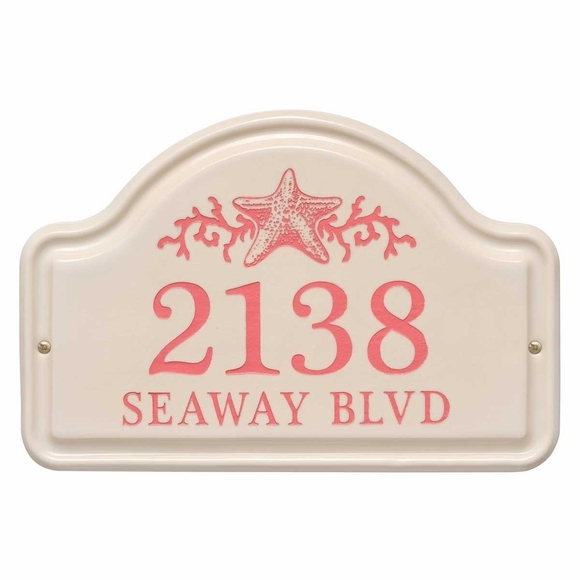 Address Plaque with Star Fish - - arch shape ceramic wall plaque has a decidedly coastal spirit. Personalized with the street number and street name you supply. Wall mount. Made in USA. High-fired vitrified ceramic withstands outdoor elements. Detailed accents and wording are deeply carved and then hand-painted in weather-resistant finishes. Includes two lines of personalization and the star fish accent. Line 2 holds up to sixteen (16) 1" characters. Wording and starfish colors (shown in small images from left to right): dark blue, green, sea blue, or coral. Dimensions: 16.5"W x 11"H x .875". Ceramic plaque with coastal theme and star fish accent is perfect for southern locations and waterfront retreats.